How do you keep them on the farm? Give them jobs in turbine factories. Iowa ranks 30th among the 50 states in population and 23rd in square miles, but it is number two in wind -- and it wants more. Iowa now has over 25,000 wind turbines and doubled its proportion of wind-generated electricity from 7% to 14% in 2009, the biggest jump in the U.S. Estimates put the current 2010 percentage of Iowa's electricity coming from wind above 17%. Because Iowa added 879 megawatts of new capacity last year (enough to power more than 200,000 homes), the state's installed capacity is now second only to Texas. It has 3,670 megawatts of total installed capacity, enough electricity for 880,000 homes -- in a state with only 3 million people. And it has over 14,000 megawatts of wind power awaiting approval. The state, known for its dairy farms and bucolic rolling cornfields, also became the leading provider of wind energy manufacturing jobs in 2009. The numbers reflect the payoff for Iowa's transformation from farm country to wind country: 2,300 direct manufacturing jobs, an estimated 5,000-to-10,000 direct and indirect jobs associated with wind, $175 million in major manufacturing facilities' investments, 2009 annual property tax payments by wind project owners of $16.5 million, and 2009 annual lease payments to Iowa landowners of $11 million. Iowa has the seventh best wind energy potential in the U.S. going for it, but a lot of states that have even better wind potential are not yet reaping the bounty that Iowa is. So what's driving the state's success? A long history. In 1983, Iowa enacted its Alternate Energy Production law, essentially the first U.S. Renewable Electricity Standard (RES). The law required the state's two regulated utilities to obtain 105 megawatts of renewable energy. 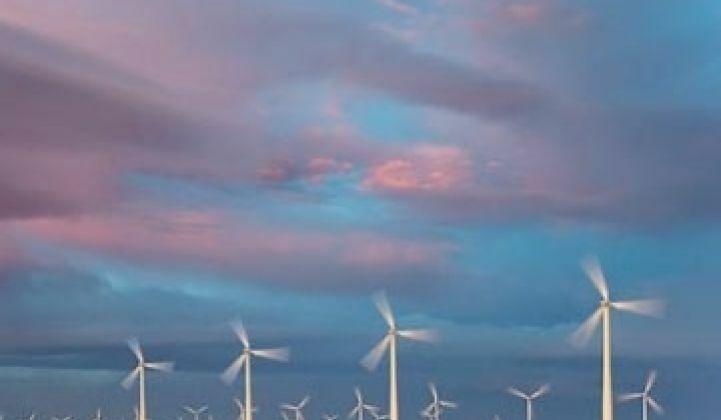 The legislation lacked enforcement provisions, however, as did the 2001 voluntary mandate requiring the state to build 1,000 megawatts of wind capacity by 2010. But both were ahead of their time and pointed the way to today's achievements. Earlier in this decade, the state's agricultural sector was suffering when, according to Mike Kelley, the Corporate Environmental Health and Safety Manager for Upwind Solutions and a member of the Iowa Wind Energy Association Board, current Democratic Governor Chet Culver and his team saw the new opportunity in wind. "They saw the wind business beginning to grow, they saw the impact and the Governor and his team became very, very proactive in looking for manufacturers, even out of the country, " Kelley said. "They really flew the flag of Iowa and what good Midwest values had to offer...and I attribute the growth from the manufacturing standpoint to some visionaries there in the state offices." With many of its farms failing, Iowa had been losing jobs -- and the people who needed them. The 200 Iowa companies servicing those manufacturers' supply chains have added more than $50 million in new revenue every year. Five community colleges and other training institutions now offer wind-related training. Governor Culver now says Iowa is ready to become an energy exporter. The next questions are whether the production expansion can be sustained and how big Iowa's wind manufacturing industry can get. To sustain wind energy production growth, Iowa needs more and better transmission so it can export electricity. Kelley said he expects regulatory hurdles to be cleared and lines to be built in the near future. Greg Watkins, the Renewable Energy Planner in the Iowa Office of Energy Independence, says they also expect continued manufacturing growth. "This may not ramp up more towers in Iowa, but will stimulate the manufacturers here producing and exporting turbine components to other surrounding states and into Canada," Watkins said. Added Joe Jongewaard, Project Manager with the Iowa Department of Economic Development: "We believe that there is a huge expansion in manufacturing capacity of wind generation equipment and that it's going to happen somewhere in the world over the next 3 to 4 years...Iowa is positioned to get more than its share of that expansion. We believe that it's reasonable to expect that 10,000 manufacturing jobs could be created in Iowa by the end of 2014." Jongewaard says the state expects to attract more companies to create those jobs and that those companies will create more opportunity for existing and new supply chain manufacturers. The Governor's office, Jongewaard said, has two project managers on staff who do nothing but work to attract wind manufacturers.